We were out for breakfast with some close friends of ours when I discovered that my daughter loved ketchup. Not in a normal kind of, oh this tastes great on potatoes, sort of way, but a, let me dip anything I can find on my plate and eat it, sort of way. Up to that point she had never even tried ketchup. We had been to plenty of restaurant’s and I always shied away from allowing her to have any ketchup. Not because I don’t like it, but because the ingredient list is terrible–full of stuff I can’t pronounce, let alone identify–other than high fructose corn syrup. The only reason I even allowed her to have it that day was because, we were out, she was getting antsy, and one of the little girls in our breakfast party was eating it and Page wanted to eat it too. The moment she tasted it, she went from being antsy, to calm and focused on what she could find on her plate to dip into it! She ate her entire plate of food! All because she was introduced to this condiment called ketchup! So what’s a mom to do? Well if you’re me you make the condiment yourself. 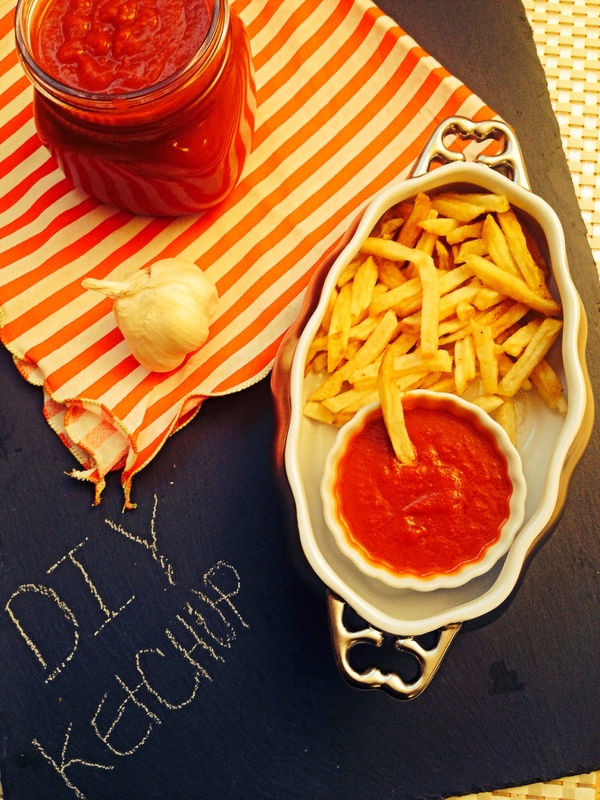 As with most things that I make myself, this ketchup was very easy to make–easier than I thought it would be. 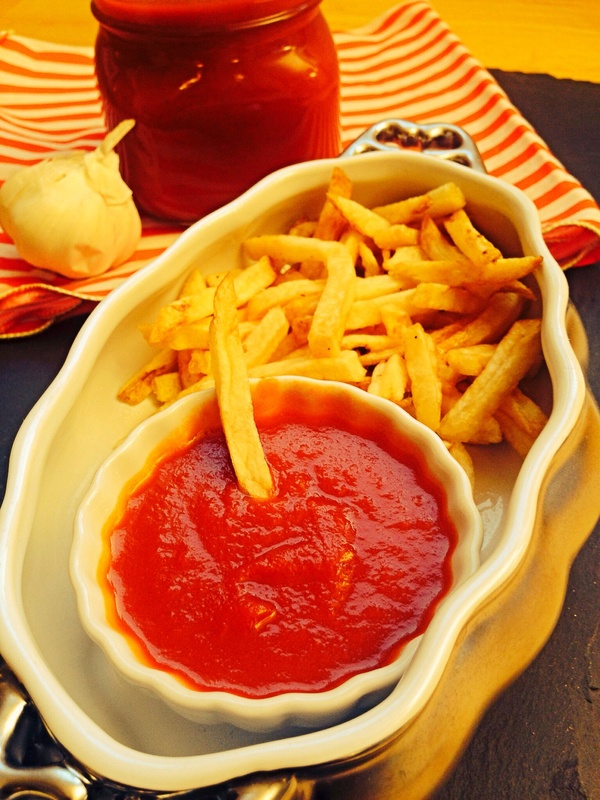 You will need a few lazy hours at home in order to make this, but that’s just so you don’t burn down the house, you cook it on a low simmer for a few hours, you could even do this in a crock pot, and the result is deliciously homemade ketchup, with no refined sugars! Makes 2 cups of delicious ketchup! Directions: Wrap all of the ingredients for the spice packet in the cheese cloth, and tie tightly with kitchen twine–make sure to leave at least 4 inches of extra twine on the end and set aside. Add the oil and the cloves to a pot and heat just until the oil begins to bubble. Turn off the heat, and let the cloves steep in the oil for 10 minutes. 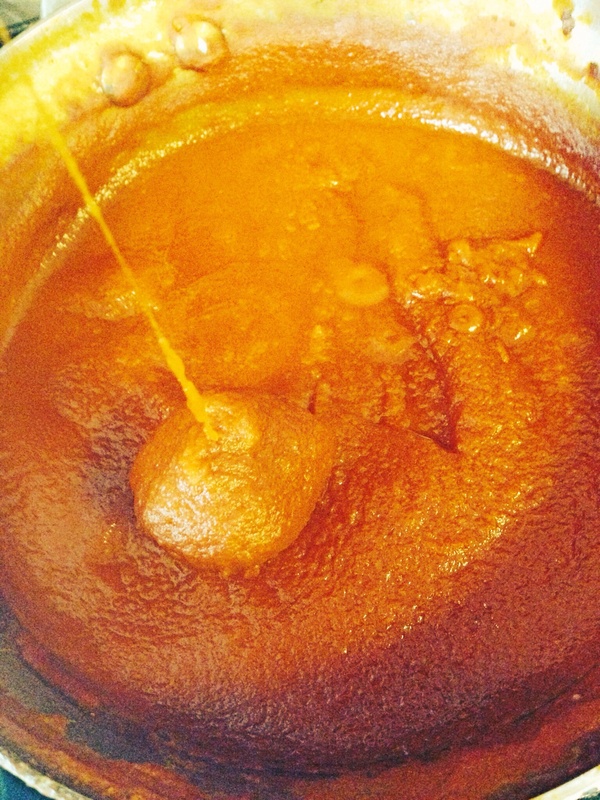 Strain the oil through a sieve and discard the cloves. Add the clove oil to a medium sized sauce pan over medium heat, add onions, garlic and saute until onion is translucent. 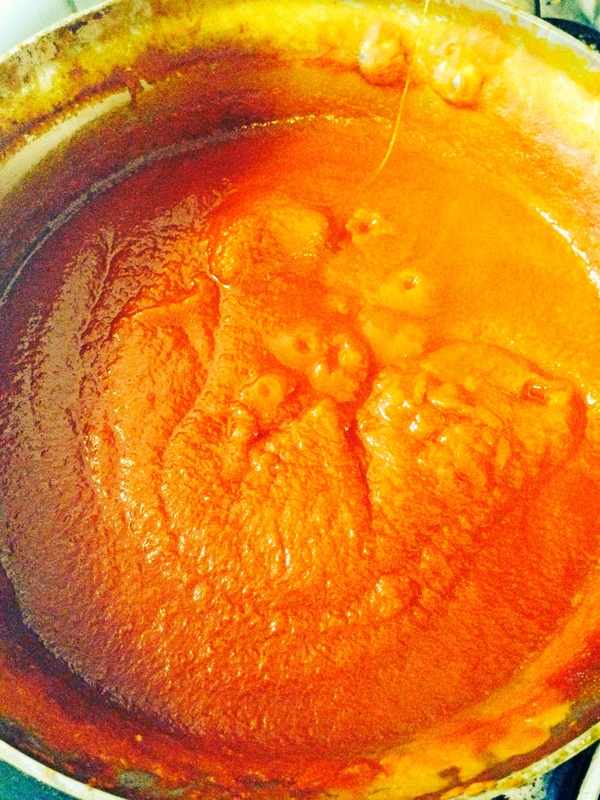 Add in the tomato paste and cayenne and cook for 2-3 minutes. 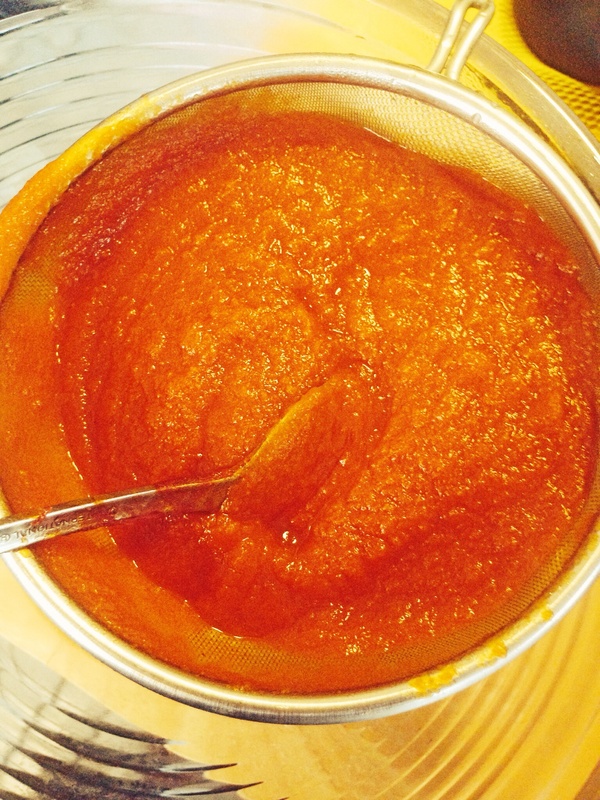 Pour the onion/tomato paste mixture into a blender/processor along with the canned tomatoes-juice and all–and blend until smooth. Pour this mixture back into your sauce pan, submerge the spice packet into the pot, wrap the excess twine around the handle of the pot. Bring the mixture to a boil, reduce the heat to low and simmer, stirring occasionally to prevent sticking, simmer until the mixture is dark red and has thickened about 1.5-2 hours. Mixture should be reduced by half. 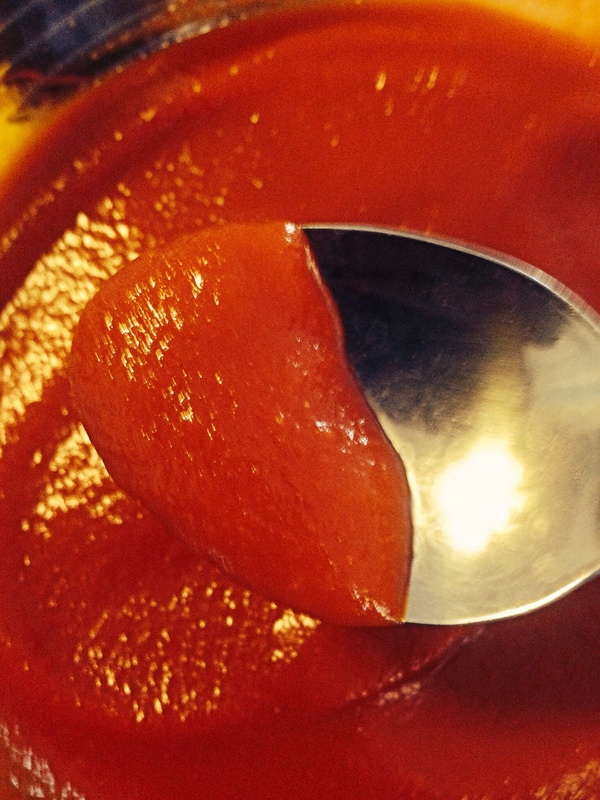 Let the ketchup cool to room temperature before transferring to an air tight container. Refrigerated, this will keep for 1 month. As a base ketchup this is pretty amazing! It taste just like the bottled stuff. 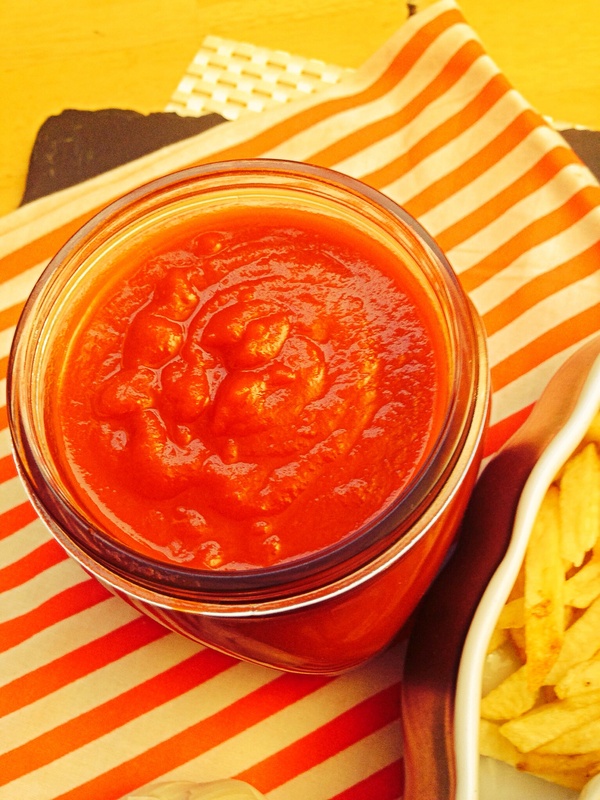 For a twist you could add 1/2 teaspoon of curry powder to half a cup of this ketchup for some pretty amazing curry ketchup! This entry was posted in brunch, dinner, Food, Food blog, gluten free, Healthy Whole Food Blog, low calorie, low carb, paleo, quick fix meals, recipes and tagged condiments, curry ketchup, diy food recipes, easy recipes, Gluten free ketchup, homemade ketchup, how to make ketchup, ketchup, kid friendly recipes, paleo ketchup, recipes, Vegan, vegetarian, whole 30 recipes. Bookmark the permalink. 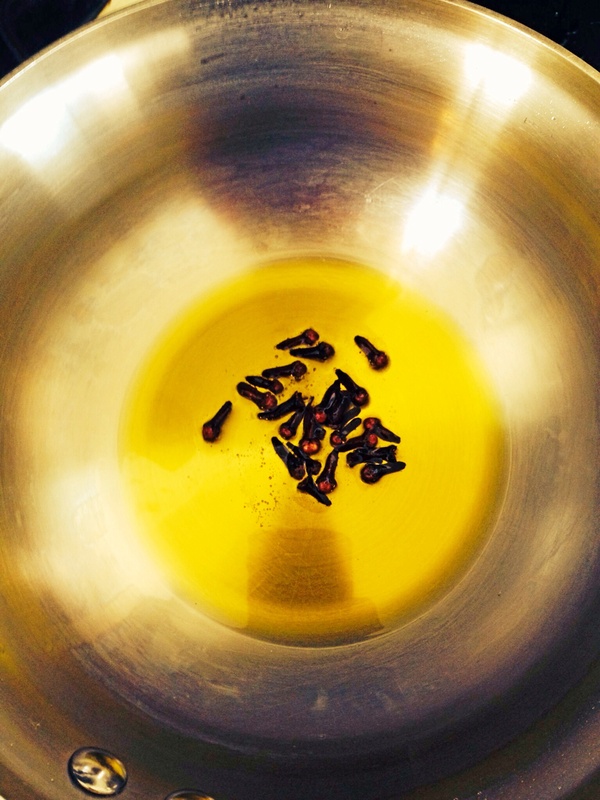 I’m the same way with cloves, I find them absolutely overpowering in most recipes, which is why I did an infusion with the oil instead of putting them inside of the spice packet directly.